Right along with my peanut butter obsession goes my new found love for pumpkin puree. How did I not discover the versatility of this vegetable before? (check out our previous post where I exposed the truth: pumpkin is indeed a vegetable). Pumpkin adds so much moisture and flavor to recipes, and for baking it lessens the need for added oil and sugar. It is perfect for cupcakes, muffins and as I just discovered for quick bread recipes too! This recipe is a twist on my traditional banana bread recipe. You can double up the measurements for 2 loafs, or just make it as is for a single loaf. I usually like to make “smaller” quantities recipe first to test it out. After all, when you are using top quality ingredients you don’t want to waste anything in case the recipe doesn’t turn out the way you hoped. Most recipes adapt well to this trick and will save you money and time as you try them out. 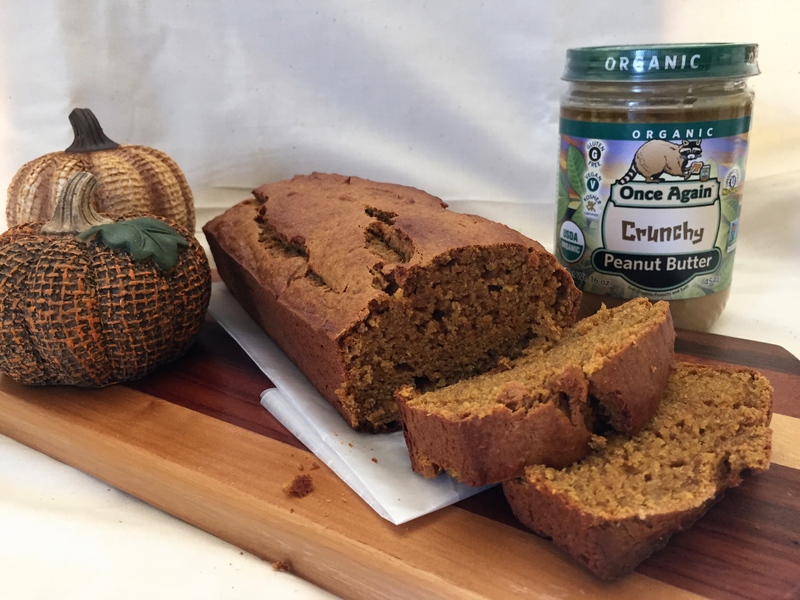 This Pumpkin Bread recipe was tested in both the half and full quantities, so you know it will work! Also as an added bonus it freezes well! I have a couple in my freezer right now, you never know when you’ll need a homemade gift or have a last minute visit from a friend! My mother raised me to always greet your guests at the door and serve coffee or tea as well as a baked good no matter what time of the day it is. And I happen to love carrying on that tradition! Although this is technically a “quick bread” recipe it tastes more like a cake to me, but I’ll let you try it and let me know what you think. Mix Once Again Peanut Butter with sugar, then add egg, pumpkin puree, mashed banana and mix together well. Add the dry ingredients (flour, baking soda, salt and pumpkin spice) and mix until smooth batter. It will be a thicker batter, place in loaf pan sprayed with butter or coconut oil. Place in pre-heated oven at 375F for 45-50 minutes or until done. Note: I used half of the flour as wheat and half as regular. You can also use creamy Once Again Peanut butter instead of crunchy. For freezing: wrap in parchment paper and foil before freezing to preserve moisture. This recipe will make one loaf, you may double it for 2. The banana was added for a sweeter bread, but you may leave it out and just increase the pumpkin puree by ¼ cup. That sounds like a great idea Ema!! Let me know if you do and how it turns out. Ooo la la. Im totally going to make this recipe. thanks for posting. Sounds o-mazing. This bread looks so great! How could pumpkin and peanut butter ever be bad?